I am Lucky Because ~ Cover a block of styrofoam in green tissue paper. 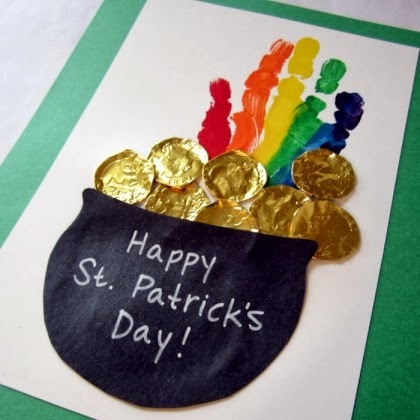 To make the fringe-cut two strips of green cardstock and adhere (spray glue is best) around the edges. Have family members write down reasons they are lucky on cardstock shamrocks and tape to green toothpicks and insert into the foam. 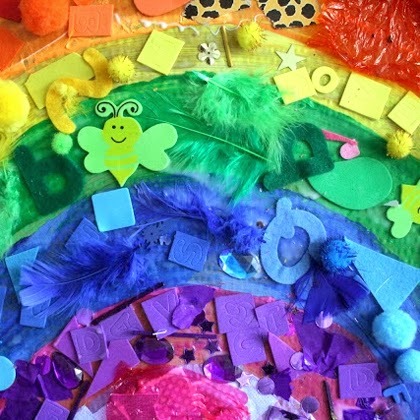 Cut out circles in rainbow colors in descending sizes using, layer and adhered them altogether centered and cut in half. Lucky Gold ~ Spray paint garden rocks gold and use a Sharpie to decorate. Giant Rainbow Collage ~ Collect rainbow-colored art scraps and make a big, easy-to-make collage for St. Patrick’s Day. 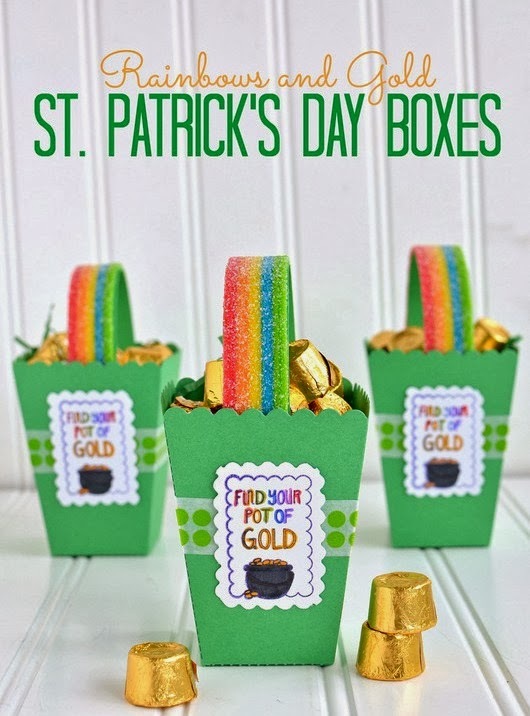 Taste the Rainbow ~ For these boxes use the popcorn box die cut. Fold and tape the box together, adding strips of green polkadot washi tape to the sides. 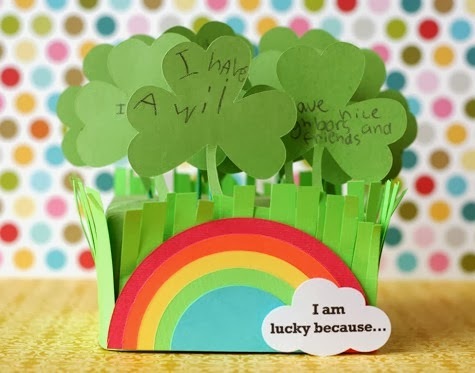 Find a printable with the sentiment you like, print, shape and glue in place. For the handles, cut three 1″x11″ strips from the leftover green paper, tape it down on the inside near the bottom of the box. 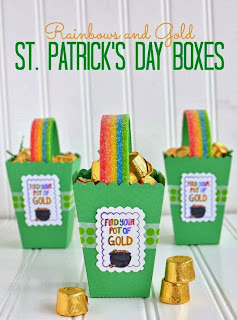 Use gold covered candies to fill the box ~ you may want to use some green Easter grass to fill the bottom of the box and then top off with candy. 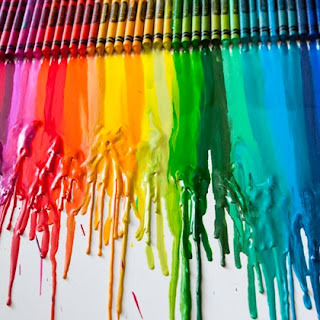 Use Rainbow "fruit" or Airheads Candy and just place and shape the strips right on top of the paper handles ~ obvioulsy you can't adhere them you are planning on this portion being edible..
Crayon Rainbow Art ~ This easy rainbow art (you just need crayons, a canvas, and a hair dryer!) is pretty enough to hang on the wall year-round. And kids of all ages will love making it. Handprint Rainbow ~ A fun "rainbow" twist on the classic handprint art idea. 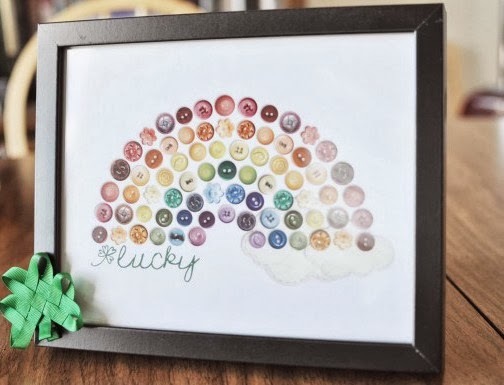 Lucky Button ~ Gather a couple handfuls of various buttons in a rainbow of colors and glue them on cardstock. 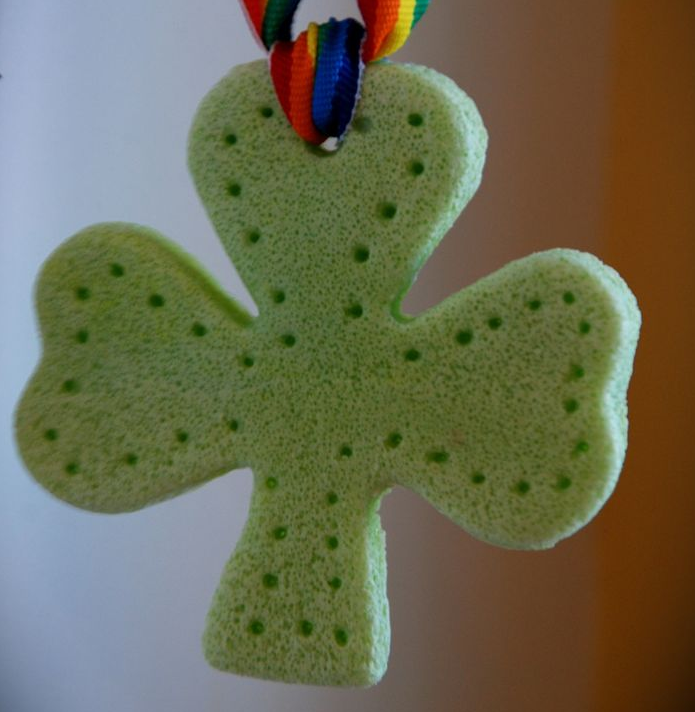 Frame and attach a clover in the corner using craft glue. 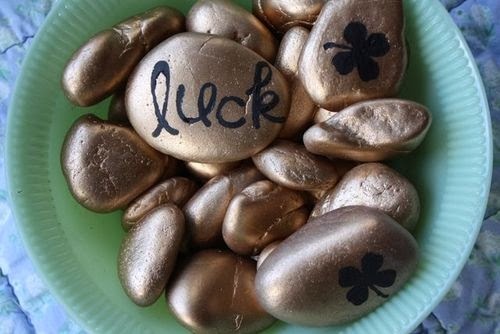 Lucky Charm ~ You will need 2 cups of Flour, 2 cups of Salt and 1 cup of Water. Mix the ingredients with a spoon until doughy and add a few drops of green food coloring . Use your hands to form into a ball then roll dough onto pan, while on the pan use a clover cookie cutter cut to shape (do this step directly on the pan so that you don't have to move it after it has been cut). Using a straw, cut the hole to hang on the ribbon and if you wish to decorate further, use a toothpick to add stitched dots on the edge. Bake at 250 degrees, starting at 20 minute increments ~ the thickness of the clover will determine how long you cook them, typically for 40 minutes. Use Modge Podge after it has cooled to make it a bit shine and sprinkle with glitter you want some bling. Add a ribbon to hang once they have completely cooled.